Thanks to everyone who's nominated a favourite London novel for our poll. Every vote is being counted, and you can put forward more than one so long as you truly think they're brilliant. We've had hundreds of votes for almost 100 different titles so far and the current results are...intriguing. To nominate a novel, simply leave a comment below or send us a tweet with hashtag #bestldnnovel. In an exciting development, we now have copies of the superb City-Lit London (Oxygen Books) to give away to two lucky participants. 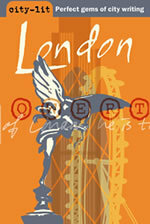 City-Lit London is a compendium of the best London writing - from Dickens to Diamond Geezer. To stand a chance of winning, simply tweet your nomination(s) as mentioned above. We'll then pick two tweets (using a random number generator). If you've already voted, but still want to participate, just send another tweet with another London novel you hold in very high regard. Voting stops at midnight on Sunday 31 January.